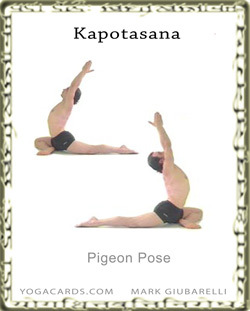 Enter the Supported Pigeon Pose before raising the arms up over the head. From a simple push up position bring one knee forward, down and out to the edge of the mat. Slowly lower the pelvis until the back of the leg touches the mat. This may not be possible if the hip is not flexible. If this is the case slowly enter allowing the knee muscles and hip muscles to gently resist. Stretch the other leg back. Lengthen through the inside of the leg all the way to the big toe. Place the hands on the mat and allow the hips to open and settle then raise the hands over the top of the head. Looking up stretches the neck and chest a little more. There are negative aspects in bringing the head back. It cuts the circulation off a little so that the mind receives less fresh oxygen and nutrients. Be aware of this when the head is tilted back and create a little space there for the elements of water and air to flow. This is a hip stretch but can also stretch the muscles of the knee in the leading leg. The lower back is also stretched. If you have knee injuries such as damage to the meniscus, ligaments of tendons then lift the hip of the leg that is behind you slightly. Without a flexible back raising the hands above the head may compress the discs in the lower back. To prevent this you can involve the abdominal muscles.